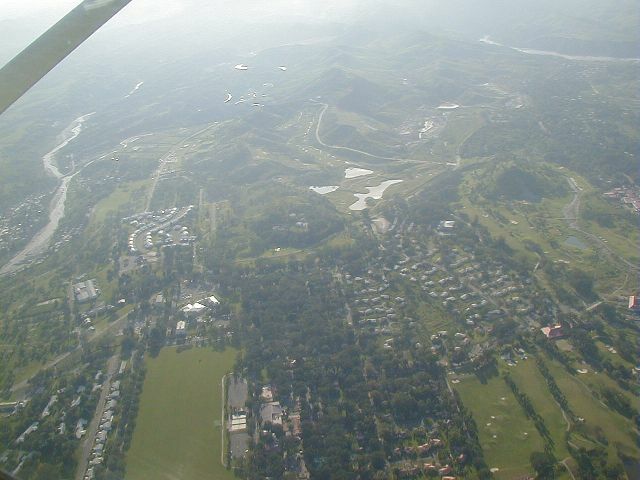 This dramatic view of western Clark Air Base was taken at about 5000 ft looking westward. 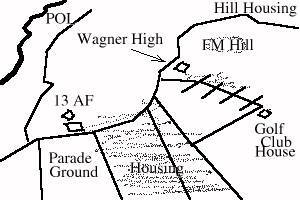 The most prominent feature is the parade ground in the lower left. The lower left corner was the old Fort Stotsenberg. The golf course is on the right side of the photo, and in the distance is Wagner High School next to a small bumb which is FM Hill (MARS Hill). Note that the FM Wash surrounding FM Hill has been converted over to a large golf course. Want to correct or clarify information about this photo? Send an E-mail to clarkairbase@clarkab.org. Mention you are referring to page "a05.htm".